Summer is officially here and with that, come refreshing looks for the season. Ash and I partnered with Express to share a casual Summer Look that can be worn to a wedding, work event, or just simply, a date! Express has just released Extended Sizing options for men and women that are now available online and in-store. Ash was especially excited about this, so I’ll let her share below. I was so happy to learn about Express’ newest Extended Sizing option because it’s a real struggle finding clothes that fit my Latina proportions appropriately. I must be honest, I was a bit skeptical when I learned about the Express campaign, because most things usually fit me very narrow and snug. I brought my sister along to help me pick some pieces and get some honest feedback. I grabbed a bunch of sun dresses and linen separates, then headed to the fitting room. Everything fit perfect- and in my normal size too (L)! I was pleasantly surprised and sad to have discounted them prior to trying on the new selection. I bought this cute polka dot dress (that I’m wearing below), along with a gingham dress, and some accessories. The all-stars of this purchase were these cute red sandals. I ended up wearing them almost every day in Italy. They matched with everything, and were so comfortable. I love the low chunky heel, ease of a slide-on, and red is honestly my favorite when it comes to accessories. I play it as a neutral and it provides that perfect pop to any look. You can shop now and receive $25 off every $100 you spend IN store & online with code: 4287. Blake went with a tan suit option paired with some brown tassel loafers. We both wore these looks in Florence during Pitti Uomo, so we wanted to be dressed-up, yet comfortable enough to walk long hours through cobblestone. 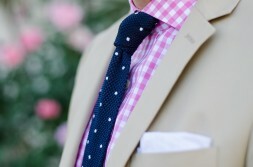 I think the tan suit paired refreshingly with the soft colored shirt and tie- perfect for the new season. We’re excited to be partnering with Express over the next few months to share our “Summer Looks” and “must-haves” from their newest inventory! You can read more regarding the current promotion here.